Once you finalize your wedding invitation card design, you may feel so relaxed and relieved. My job is doneis it really so. The answer is a no because in the other second you realize that you are yet to finalize wedding invitation wording and send it to the wedding card designer. You think that I just have to mention my name, my parents &and grandparents’ name, my to be spouse’s name, the venues and the timings, etc. This Indian Wedding Invitation Wording seems simple but you have to figure out a lot of details. To furnish the complete details to the wedding card designer you and your family have to decide upon the following information. There is always a precise wedding card format to which you need to follow.so lets first discuss it. Guests will be invited by whom – you, your parents or your grandparents? Salutations to address your parents, grandparents and the parents of your future spouse. Salutation, for example, Smt. & Shri or Mrs. & Mr. Should Ji be added with the names? For example, Ratna Ji and Neel Patel Ji . Additional details, if any: Simple itinerary, for example, say Wedding 8:30 pm onwards or Detailed itinerary that includes complete information on baraat welcome, Dinner, Pheras, and Vidai timings. The Map; illustrated map or map overleaf or Google Map location link is to be provided to the guests so that they can reach the destination with ease. Now when the basic Wedding Card Format and structure of an Indian wedding card is clear in your mind, you can easily finalize that wedding invitation matter. Just go through this article and it’s a promise, this work will be like a child’s play for you by the end. As per the rules whosoever is spending money for the wedding is called the host . In India, we precisely don’t follow this rule, our grandparents’ or parents’ names are inserted here. It’s rather a matter of respect in India and to whomsoever, we respect more is named here. Here you invite your guests to your wedding ceremonies. In Indian wedding cards, so many options are there to select the words of this line. Like solicit the honor of your kind presence to bless their beloved son or request your company at the wedding of . Here the name of the bride and the groom is inserted. In the case of Bride side invitation card, her name comes first. And is on the top. In the case of the Groom side invitation card, his name is on the top. In Indian wedding invitation cards, usually grandparents or parents name is mentioned under their grandchild’s name in both cases, be it a groom or a bride. This section is used to provide ceremony related details like date, time and venue etc. 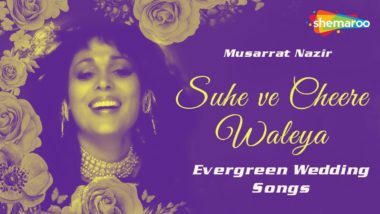 RSVP, best compliments, Shadi Shayari and BAL Manuhar, etc are added to this section of the wedding invitation card. As now you are familiar with the fundamentals and essentials of Indian wedding invitation wording, you can easily finalize your wedding card! However, we have discussed this post further by providing you a few wedding card wordings and wedding card formats. These formats will assist you in finalizing your wedding card and these Indian wedding invitation wording will surely convey your wedding invitation message. We have discussed the wedding card matter for groom and bride both. This Indian wedding card matter in English for Daughter will surely help you to choose the wording for your daughter’s wedding card. In Case both the parents are hosting the wedding Ceremony together than you can choose these types of wordings for wedding invitation cards. Indian Wedding invitation wording for both parents hosting the wedding ceremony is like the below format. This Indian wedding card matter in English for Daughter will surely help you to choose the wording for your daughter’s wedding card. 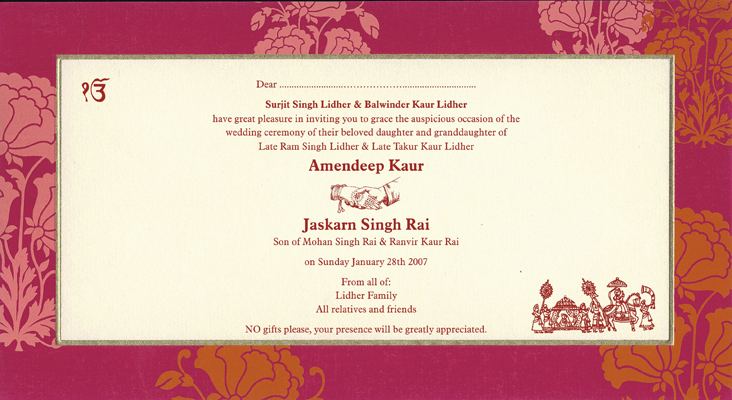 This wedding card matter format includes the reception invitation wordings also. Muhurtham between: 10:15a.m & 11:00a.m. This Indian wedding card matter in English for Daughter will surely help you to choose the wording for your daughter’s wedding card. This format of Indian wedding card matter in English for Daughter also includes quotes which are very impressive and it will surely help you to choose the wording for your daughter’s wedding card and impress you, guests. “In true marriage lies Nor equal, nor unequal. In Case both the parents are hosting the wedding Ceremony together than you can choose these types of wordings for the invitation. Wedding invitation wording for both parents hosting the wedding ceremony is like the below format. successful completion of the ceremony. 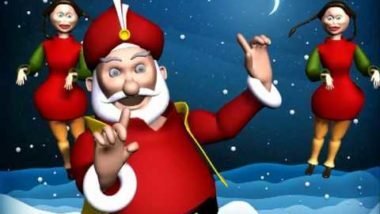 Punjabi Boliyaan Santa Special Shava Santa !